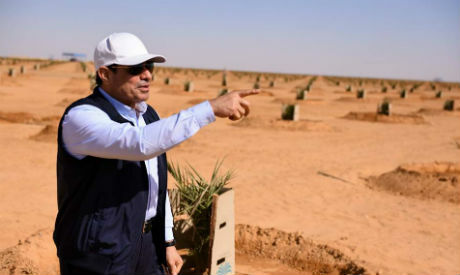 Egypt’s President Abdel-Fattah El-Sisi inspected a number of agricultural developmental projects in Toshka in the southern desert on Friday morning. In an official statement, his spokesman Bassam Rady said El-Sisi inspected date, wheat, and grape farms, as well as sheep farms. The execution of the mega-projects is part of a plan to develop the area and establish new urban communities which rely on agricultural activities, including food processing and other industries. Toshka is the biggest plantation in Egypt on an area of 60,000 feddans. It relies on water from Lake Toshka through a lift station; seven pumps supply 7,000 cubic metres of water per hour. Around 40,000 feddans of land are allocated for 2.5 million date palm trees, with the aim of placing Egypt on the global map in date production and export. An area of 20,000 feddans has been also earmarked for the cultivation of strategic crops like corn and wheat, as well as 200 feddans for grapes. The president praised the efforts, pointing at the wide positive impact such projects have on creating sustainable development and a better future for Egyptians.